“In France, there’s almond flour in everything—except clafoutis,” Belinda Leong says about the rustic dessert of fruit baked in batter. Bucking tradition, she includes the flour in her clafoutis to add texture to the custardy interior. This light and delicate buttermilk custard is perfect when topped with juicy, sweet cherries and tangy lime zest. 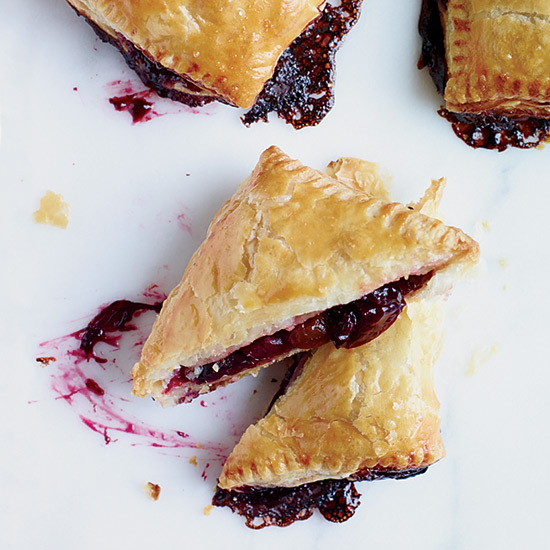 Puff pastry makes quick and impressive work of these buttery, sweet cherry-filled hand pies. These buttery oatmeal cookies are made with sour cherries in syrup—a juicy, sweet-tart alternative to the usual raisins. You can use Amarena cherries or, for a more grown-up indulgence, brandied cherries.